A spread of photos from all 4 races. A recap of the Varsity Girls race at Mississippi College in a slideshow.. On the cover the start of the race. Selected by the voters on Mississippi Milesplit. This article will show which teams are signed up to compete this weekend and what meets they are going to. Just in time for the Mississippi College High School Opener here are the Top 300 boys times at Choctaw Trails for last year. On the cover Ahmad Sykes of Greenville. Goals for the girls competing in the Mississippi College High School Season Opener. The listing only has the top returning runners and times from 2014. On the cover Kyannah and Kyarrah Grant, Choctaw Central. This meet uses the times from both meets yesterday to score a boys meet. The girls cannot be done as there was different distances used. On the cover Raymond Mion, St Stanislaus. 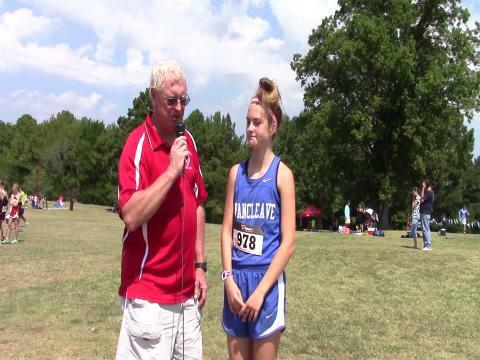 Check out over 1,400 photos taken from the high school and middle school races at the Mississippi College High School Opener on August 29th on the Choctaw Trails. Find your photo among the 1,000+ runners! Quick interview with Lina after her win.